Lance for future reference which p/n did Kb order for you? I'm out in the Gulf now. I'll look in my truck when I get back. Just found this part number 15534-73030 for 52.64$ Kumar Bros. , they are on ebay , amazon and their own website. I may as well get one now my pump is original and they don't last forever. Item is pictured with the water return pipe installed and comes with a gasket. Thanks for the info it would have taken me hours to dig up that stuff. We have enough youth: how about a fountain of "smart"? My OEM is 30 Y.O. and going strong! A "Kubota lawn tractor water pump" -- is a Kubota-lawn-tractor, water pump -- not a Kubota-brand, lawn-tractor, water pump. It's from India. Only worry is that the bearings are likely the cheapest available in India. To me its equal to Harley and John Deere parts, a lot of that cost is just for the name. Rather than start a new thread, I'll wake this one up since it's already linked in the Wiki. My situation is a little different from OP's: M35B motor (Kubota V1305 block). I have a very slow leak of coolant from the "weep hole" at the bottom in my freshwater pump. I suspect the bearings are leaking. I'm starting to shop around for replacements in anticipation of replacing it this off-season. Diesel Parts Direct lists genuine Kubota #16251-73034 ($168). There are a bunch of knock-offs on ebay and Amazon, including the ubiquitous Kumar Bros stuff, for around $50. All try to make it appear like a Kubota pump, but it's obviously a "pump for Kubota". Some call it #16241-73034, or other totally different part numbers. In addition to concerns over the bearings, I also noted that breakdown pictures on the listings show an impeller that looks like a cheap stamped sheet metal impeller that looks sort of like a cowles blade. The Universal parts list (p. 43 #34, p/n 200825) shows what looks like a spiral-fin casting that would seem to be better quality. Do any of you have experience with replacing this pump? Is there a recommended dealer with genuine Kubota part for less than $168? Do the cheap knock-offs last? Any idea how outrageous is the cost of the genuine Westerbeke part? I'll have additional questions as I move forward about various things like how to remove and re-tension the v-belt, since I've never removed it before (on any motor). So I'm totally new at all this. Also, I'll be asking for recommendations of other things to replace while I have it all apart. I can imagine that coolant hoses may be softening up a bit after 17 years exposure to ethylene glycol. Messicks, a reputable bricknmortar Kb dealer lists that p/n for 141. Say, 100 difference/17 yrs = $6 yr. Easy decision in my mind if there’s a quality question. Verify your pump diameter- IIRC there were different size gear covers, depending on the engine mfgr date. re different sized gear covers... can you elaborate? I bought and installed a new pump a couple of weeks ago. It fit back together no problem, but I'm wondering if the pump wheel inside might be smaller diameter than intended reducing flow. It is equivalent to the one I'm replacing but that one might not have been correct either! Not much. I don't know the diameters. - Try talking to the service gurus at Engines1 (western branch diesel) in VA (caution they are Wb not Kb dealers, so may know only the Univ 35B impeller). - Pull the different impeller P/Ns (2 sizes, I believe) or complete pump P/Ns off the Kb engine block parts manual (Techwiki site > manuals page) and see if you can find anything on either online. 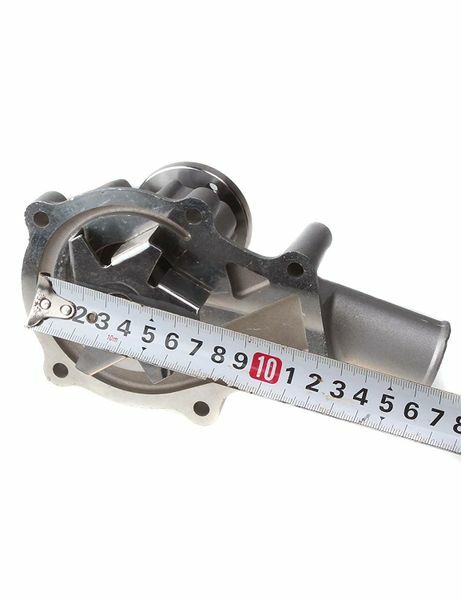 - Or try the parts folks at Messicks Kb dealer (but they likely don't know much other than using the Kb engine s/n as to which impeller/pump it takes, probably don't know the exact dimensions. 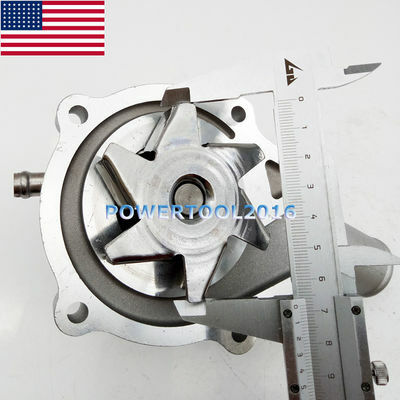 - last resort, order the later model pump or impeller from Kb and measure it. Is it possible that Wb spec’ed a larger impeller than Kb because of all the extra hose to/from the hot water heater? Maybe the late model Kb is still too small? FWIW, my pump is original (has factory paint) and the pump housing (behind the pulley) is approximately 2” dia, which strikes me as pretty small. I don’t plan to tear it down to measure the impeller. I swore I wasn't going to get involved but here goes anyway...... the only reference I can find to the two different Kb part numbers is a 70mm dia impeller. But the internet can be wrong, we know 'eh? The parts manual doesn't list the serial number break between the two. The couple of forum posts I have seen defo reference a larger impeller, but no dimensions provided. There's different Kb P/Ns for the two pumps for the "35B block" and different gear cover P/Ns, and different impeller P/Ns. Messicks appears to have both pumps in stock -- maybe the parts dept would pull them and measure their impeller diameters? The Wb parts manual shows ONE pump, one impeller for both the XPB and 35B, which I find strange. Seems the 35B might have a larger pump? The Kb manual for the "XPB" block shows ONE impeller BUT TWO different pumps delending on the Kb engine serial number. Not sure what to make of the above! What's the issue anyway? Is the engine overheating? 70mm impeller would exceed the diameter I measured for the pump housing. Did I measure the wrong thing? I can try to get a picture when I return to the boat in a few days. You mentioned different sized gear covers. What, exactly, is a gear cover? What, exactly, is a gear cover? Brakin, See your parts manual - the Gear Case Group diagram. This Kb pump on eBay for the "35B" says "70mm," but unless my eyes are fooling me it looks to be 65,7mm. Perhaps 70mm and 65,7mm those are the two size pumps?